Obama's world without nuclear weapons? PAUL JAY, SENIOR EDITOR, TRNN: Welcome back to The Real News Network. I’m Paul Jay in Washington. Joining us again is Jonathan Schell. He’s an author who’s written extensively on the issue of nuclear weapons. He’s also got a recent piece in The Nation. He’s also a board member of The Real News Network. Thanks for joining us again, Jonathan. JONATHAN SCHELL, JOURNALIST AND AUTHOR: Great to be back. JAY: So this conference that was held by President Obama with 46 world leaders to talk about nuclear weapons and proliferation issues, how much of that was a propaganda event for various reasons, but perhaps mostly to do with the isolation of Iran? ‘Cause there’s been a lot of critique about the hypocrisy about the American position on Iran, demanding they don’t have one weapon when the Americans have so many. So under the NPT, the Non-Proliferation Treaty, the weaponized powers are supposed to reduce. And that’s part of the agreement for countries like Iran, not becoming westernized. So is this kind of more a propaganda event than it is, really, of substance? And what do you make of the whole Iranian issue? SCHELL: Well, I don’t think it’s a propaganda event, because one of the explicit purposes of it was to build support for putting stronger sanctions on Iran through the UN Security Council. That’s why they made such a big deal out of Hu Jintao coming from China and of his statement that he would cooperate in some unspecified way in thinking about sanctions upon Iran. So that was a very explicit objective of the whole thing. 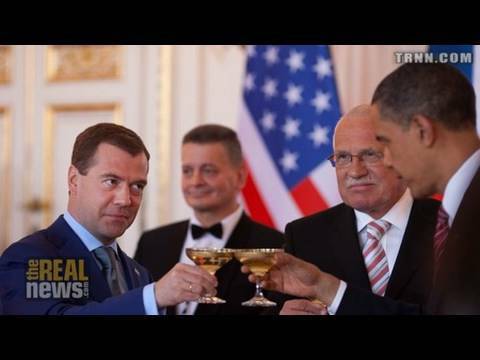 JAY: By propaganda event, I was talking more about the deal between United States and Russia. I know everyone thinks it’s a good thing that they have less weapons, but it’s kind of—when they’re left with, still, so many nuclear weapons, the reduction doesn’t seem so substantive, except it gives them an argument that they’re doing their role under the NPT, so now that adds to the ability to gather support for sanctions against Iran. SCHELL: Yeah. The position of the United States now, the stated position, is we now are in favor of moving to a world free of nuclear weapons. That’s the stated position. But it may take a very long time. So all we can do now is take certain steps. And obviously the "New START Agreement", as they call it, it is a step of this kind. And once again, one of the explicit purposes here, which does have reference to that larger vision, is that because the US is taking those steps, it’s showing that it’s fulfilling its part of the NPT bargain, that bargain being that the existing nuclear powers will go to zero, and in exchange the other countries of the world will not develop nuclear weapons. So all of that is explicitly stated. But I think the question that hangs over it all is whether the commitment and the actual steps towards the visionary goal are real enough or large enough or even serious enough to give credence to the plan. Let’s suppose for instance that Russia and the United States were to get together, have a solemn meeting, have interagency processes, big studies, and so on, and say, we mean this thing about going to zero nuclear weapons as we’re required to do under Article 6 of the Nonproliferation Treaty, and we’ve got a schedule for doing it, and here’s the point at which we’ll invite the other nuclear powers in, and here’s the role for the nonnuclear powers, and so forth, and we’re to make a very significant commitment that was believable, then that really would transform the proliferation picture, in my opinion, because then you’d have a united world. You’d have the great powers united, all of them Non-Proliferation Treaty moving to a nuclear-weapon free world and saying to Iran or North Korea, we are hardly going to stand for it if we get out of this business and you remain in it. JAY: But they’re clearly not making those kinds of serious steps. SCHELL: They’ve done some things, but nothing like that. And so then the question becomes, as you say, is this a sort of a PR program or a propaganda program merely to pretend that we are serious about nuclear disarmament, in order to get some sort of moral prestige for persuading other nations to go along with us in sanctioning Iran or North Korea, and in that case our intention would be simply to hold on to our nuclear weapons for an indefinite future, while persuading other people not to get them, in other words to shore up the double standard, to shore up the two-tier system, which is so difficult to maintain now? JAY: And the other big piece of this two-tier system or this system of hypocrisy is the issue of Israel. I mean, if the United States—if there was one single thing the United States could do that would send a message they were serious about all this would be to demand that Israel sign the Nonproliferation Treaty and come under its terms and everybody acknowledge Israel has weapons. This kind of crazy piece of theater that they pretend as if nobody knows is getting silly. But it makes the US position on Iran all the weaker. SCHELL: Well, it does, because, really, the solution that one would hope to see achieved there would be a nuclear-weapon free Middle East, and obviously that would mean that Israel would have to surrender its nuclear weapons, and there’s not only no sign that they’re doing that, but they won’t even admit or state that they actually have this arsenal. And by the way, that’s part of a larger pattern and something that needs mentioning in connection with the Nuclear Security Summit that just occurred with the 46 nations, because the purpose of that was to roll back nuclear weapons materials, namely highly enriched uranium and plutonium. But the greatest dangers of the proliferation of those materials comes from countries that are now all US allies, and it just went absolutely unmentioned in this summit. And one is Israel; another is Pakistan, which is building up its nuclear arsenal; and the other is India. And the US has actually entered into an agreement with India to provide it with fuel for its reactors, which enables it to divert the fuel that it is currently using for its reactors to nuclear weapons. And so it’s a deal that really fosters India’s nuclear weapon program, and then Pakistan responds, and so on. And so things are sort of running out of control in those areas, and all the attention was placed on recouping this uranium that’s in certain research reactors in Canada and Ukraine and Mexico and places like this. It’s good to do that, but it’s hardly part of the problem. JAY: So in the first segment of the interview, we talked about this sort of 20th century or 19th century grand chessboard kind of thinking, that these great powers, if it wasn’t for nuclear weapons, would go to war with each other. And that still seems to be the thinking, but they don’t seem to talk about it in a way that people actually understand that’s what they believe. SCHELL: Certainly among conservatives there is the vision that the United States is still in a world of great power competition and that nuclear weapons are needed to deal with that, and they want nothing to do with the abolition of nuclear weapons, a nuclear-weapon free world. But with the Obama administration it’s not clear. Now, if they have that vision, if they think that we’re going to be involved in sort of 19th-century great-game, great-power jockeying, and further believe that nuclear weapons are needed for those purposes, then they should come out and say so. They should just say: our game here is to hold on to our nuclear weapons because we need them in a dangerous world, and they shouldn’t bother us by talking about a world free of nuclear weapons, and we should just get on with it, and then we could at least deal with what’s real. But it’s none too clear. It’s just left in a haze of ambiguity, which of these visions is the one they truly believe in and are moving toward. JAY: Which leaves just the propagandistic worldview of the Cold War hanging like a cloud over everyone without actually saying so. SCHELL: It does still hang like a cloud. I mean, I’m grateful and I’m happy that the vision of a world without nuclear weapons has been put forward, and I’d like to think that that’s real—and there’s some evidence for it, and some good things are being done. I’d like to see it go much farther and much faster. We’ll have to see. JAY: Thanks for joining us, Jonathan.